Are you looking for a world class emotional intelligence framework to improve performance, happiness, engagement and talent selection and development? Do you want to live a happier, healthier and more successful life? 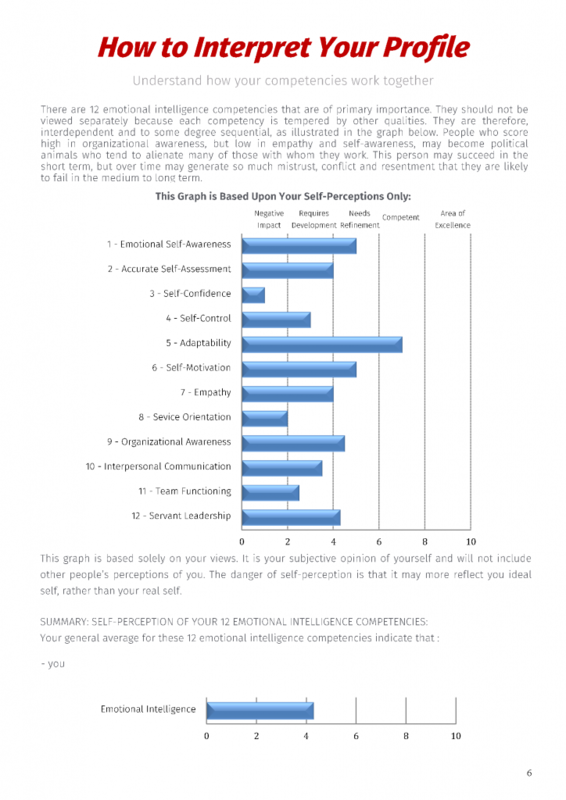 Neuro-Link’s assessment is called the 12 Emotional intelligence Competencies Profile™. With this profile, you get a comprehensive view of a person’s job performance, skills, strengths and development needs as well as suggestions for further development. It provides insights into 6 intrapersonal competencies and 6 interpersonal competencies of a person. Our 12 Emotional Intelligence Competencies Profile™ is a 360° evaluation that combines performance feedback from you and a variety of observers including your managers, peers, direct reports and internal customers who know you well and does not have an ax to grind with you. If you are doing the 12 Emotional Intelligence Competencies Profile™ for personal development purposes, your observers may be your life partner, friends and family. It illustrates your perspective, your observers’ perspectives and the average between your and their perspectives of the 12 emotional intelligence skills that are of primary importance for your happiness, effectiveness, relationships, success and leadership. Feedback includes a debriefing with a trained Neuro-Link consultant to provide an in-depth understanding of your report results. An atomized, online debriefing video is also provided with each report. Neuro-Link’s 12 Emotional Intelligence Competencies Profile™ can be done by individuals as a stand alone. It also complements various development initiatives like developing high potentials, leaders and teams. We therefore offer an online, Emotional Intelligence Practitioner Self-study Program to people practitioners and business partners worldwide to use our assessments and learning solutions as tools to optimize performance and/or sell for profit. Learning how to debrief on our EI profile and sell it for financial gain is part of the practitioner training. The 12 Emotional Intelligence Competencies Profile™ is also the point of departure for doing Neuro-Link’s cutting edge High Achiever Emotional Intelligence Development Program. It serves as a world class framework to develop yourself and others. Neuro-Link presents online, emotional intelligence practitioner training for teachers, lecturers, trainers, professionals and consultants about the 12 emotional intelligence skills that are of primary importance to optimize people’s performance. This self-study program certifies practitioners to compile and debrief our EI profile. It consists of videos, manuals, assessments and assignments. WHY DO AN EMOTIONAL INTELLIGENCE PROFILE? Emotional intelligence is extremely important and will help individuals with a variety of skills, such as the ability to manage relationships, have better social relationships and to influence, inspire and motivate not only yourself but also others. Effective leaders need a high level of emotional intelligence. This will influence efficiency, effectiveness, productivity, team work and success. Emotional self-awareness and self-control are important because this will help individuals and leaders to recognize their strengths and weaknesses. This will help them to improve on emotions that obstruct healthy relationships and will help you to handle conflict better and address problems in the right manner. Emotional self-awareness will also make people aware of their feelings and how to manage those emotions. Self-control will let you reflect on thoughts before expression. This is very important in any job, because your bad emotional actions can have big implications on your job. Effective Communication: What is the benefit of emotional awareness and management if you are unable to clearly express your thoughts? Luckily, individuals with emotional intelligence also have the skill of effective communication. They are able to clearly convey directions and know what to say in order to inspire and motivate others. An important skill for leaders, communication can be a deciding factor in whether the team listens or not. Social cohesion and team functioning: This helps you to be tuned to the emotions of others and are able to pick up on what is going on around them. With good social cohesion and team functioning you will be able to sympathize with others by putting yourself in the employee’s shoes and giving helpful feedback. Social cohesion is critical, to inspire and motivate a team. Leaders with emotional intelligence are equipped to handle conflicts and provide resolution. Leaders can use their emotional intelligence to develop a more effective workplace. Strong organizational awareness will help you to see the organization and its people in a different light. It’s also important to be a servant leader, to put other people’s interests high on the ranking, to give without expecting back and to do things without looking for the rewards. The most comprehensive tool I have come across for consolidated understanding of the uniqueness of each of us, as individuals. It is an empowering insight as to how our intelligence in all these 12 areas makes us truly efficient and how perfectly we actually do work. The manner is which our “blind” spots are highlighted is fascinating and informative in a naturally positive manner. This is a must have for any Learning & Development specialist, especially those involved in talent management. A powerful tool for growth in anyone on the journey of self-improvement and discovery. If you think you are emotionally intelligent, chances are that your probably not! This profile will enable you to embrace your strengths but to also recognize your weak spots pertaining to emotional intelligence. It’s a powerful tool to get to know and understand yourself better but also to understand your emotions and behaviors towards others. Without understanding yourself, you will not be able to understand others!! I highly recommend this profile as the first step to become more emotionally intelligent. After completing the emotional intelligence course I have developed the skills to identify and manage my own emotions and the emotions of others. I now have the ability to use and identify emotions and to apply them to reach personal goals. The importance of managing one’s emotions, including the ability to regulate these emotions, contribute to improve the lives of others. What can be of more importance than to be a good communicator! This EI course will enable a person to interpret, and respond to the emotions of others in a positive and uplifting way and therefore makes a difference in people’s lives on a daily basis. The techniques and activities suggested in our profiles are for educational, training, and/or self-development purposes. The author/owner does not directly or indirectly present any part of the profiles as diagnosis or as a prescription for any ailment for any person. People using the techniques, information and activities reported herein, do so for education, training or self-development purposes.